An application is the primary resource in Amazon Kinesis Data Analytics that you can create in your account. You can create and manage applications using the AWS Management Console or the Kinesis Data Analytics API. Kinesis Data Analytics provides API operations to manage applications. For a list of API operations, see Actions. Kinesis Data Analytics applications continuously read and process streaming data in real time. You write application code using SQL to process the incoming streaming data and produce output. Then, Kinesis Data Analytics writes the output to a configured destination. The following diagram illustrates a typical application architecture. Each application has a name, description, version ID, and status. Amazon Kinesis Data Analytics assigns a version ID when you first create an application. This version ID is updated when you update any application configuration. For example, if you add an input configuration, add or delete a reference data source, add or delete an output configuration, or update application code, Kinesis Data Analytics updates the current application version ID. Kinesis Data Analytics also maintains timestamps for when an application was created and last updated. Input – The streaming source for your application. You can select either a Kinesis data stream or a Kinesis Data Firehose data delivery stream as the streaming source. In the input configuration, you map the streaming source to an in-application input stream. The in-application stream is like a continuously updating table upon which you can perform the SELECT and INSERT SQL operations. In your application code, you can create additional in-application streams to store intermediate query results. You can optionally partition a single streaming source in multiple in-application input streams to improve the throughput. For more information, see Limits and Configuring Application Input. Amazon Kinesis Data Analytics provides a timestamp column in each application stream called Timestamps and the ROWTIME Column. You can use this column in time-based windowed queries. For more information, see Windowed Queries. You can optionally configure a reference data source to enrich your input data stream within the application. It results in an in-application reference table. You must store your reference data as an object in your S3 bucket. When the application starts, Amazon Kinesis Data Analytics reads the Amazon S3 object and creates an in-application table. For more information, see Configuring Application Input. Application code – A series of SQL statements that process input and produce output. You can write SQL statements against in-application streams and reference tables. You can also write JOIN queries to combine data from both of these sources. In its simplest form, application code can be a single SQL statement that selects from a streaming input and inserts results into a streaming output. It can also be a series of SQL statements where output of one feeds into the input of the next SQL statement. Further, you can write application code to split an input stream into multiple streams. You can then apply additional queries to process these streams. For more information, see Application Code. You can configure a Kinesis Data Firehose delivery stream to write results to Amazon S3, Amazon Redshift, or Amazon Elasticsearch Service (Amazon ES). You can also write application output to a custom destination instead of Amazon S3 or Amazon Redshift. To do that, you specify a Kinesis data stream as the destination in your output configuration. Then, you configure AWS Lambda to poll the stream and invoke your Lambda function. Your Lambda function code receives stream data as input. In your Lambda function code, you can write the incoming data to your custom destination. For more information, see Using AWS Lambda with Amazon Kinesis Data Analytics. For more information, see Configuring Application Output. Amazon Kinesis Data Analytics needs permissions to read records from a streaming source and write application output to the external destinations. You use IAM roles to grant these permissions. Kinesis Data Analytics automatically provides an in-application error stream for each application. If your application has issues while processing certain records (for example, because of a type mismatch or late arrival), that record is written to the error stream. You can configure application output to direct Kinesis Data Analytics to persist the error stream data to an external destination for further evaluation. For more information, see Error Handling. 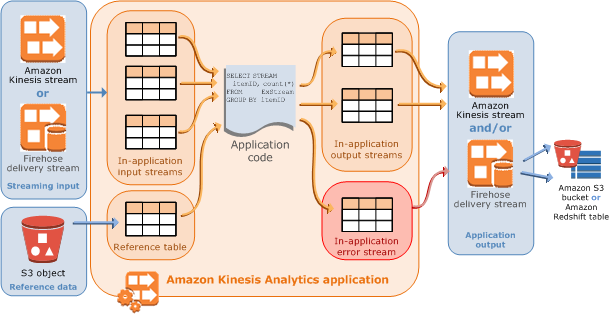 Amazon Kinesis Data Analytics ensures that your application output records are written to the configured destination. It uses an "at least once" processing and delivery model, even if you experience an application interruption. For more information, see Delivery Model for Persisting Application Output to an External Destination.